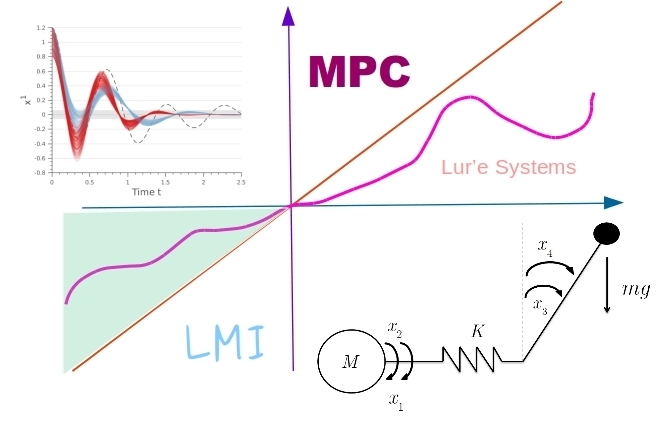 A large number of control systems in practice can be modeled as a Lur'e system, for example, flexible robotic arms or nonlinear systems with common sector-bounded nonlinealities such as quantization, deadzone and so on. In most cases, the nonlinearities are uncertain and possibly varying over time. There are many approaches to control Lur'e systems; however, most of them cannot take into account the constraints of states and inputs. On the other hand, MPC can handle the constraints efficiently but finding a global solution for a nonlinear optimization problem is often demanding, not to mention the uncertainty. Alternatively, one can be formulated as a robust MPC problem and recast it in the form of a Linear Matrix Inequality (LMI), which can be solved by currently available softwares. - Do simulations to illustrate the method. Control Systems Theory, MPC, Nonlinear Systems, LMI. Background knowledge: Optimal Control, Nonlinear Control and Linear Algebra.